I never had the Barbie dream house...but, boy did I want it.....I did have one silver Barbie Corvette parked under my bed though! As I walked down around the corner from Spring St on 6th, in downtown LA...with hot cups of hot beverages...I saw these "dolls" in the window of a little store crammed with "previously-loved" items....called FLEA...look at the paintings of a girlhood wonder! 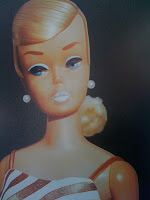 Style CHECK: this is what I had on, on my Barbie Discovery Day! and oh BARBIE!!! 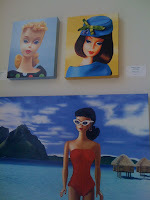 do i wish i knew who painted these....I really thought they were photos til' I saw them up lcose with my eyeballs! and MOM, you'd love these!!!! hot pink and love to you all!!!!! I LOVE those! I'm a Barbie fan. But most of mine are safely packed in boxes in a cool part of the garage. One day I hope I have a place to display them. Even the ones that have lavender mascara in their hair because I thought that was a good idea when I was 10.
love love love your outfit. had something like that on the other day wish i had taken a pic of it too. I love Barbies as a kid. Stila just released a Barbie eyeshadow palette with 12 colors in it. 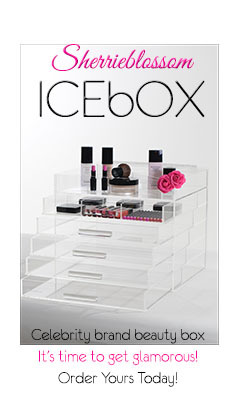 I couldn't resist & ordered one cos I thought it's a good deal and the cover with barbie face is so pretty. 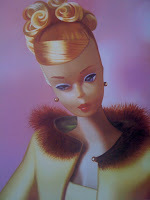 i don't like the recent barbies they have, they just don't look as pretty as the ones from the 80s or 90s in my opinion. You should do a make-up tutorial on them!!! 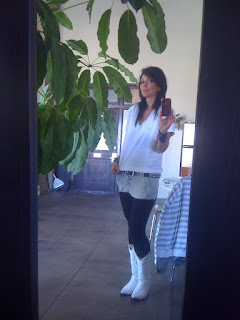 kandee you are the best! do you ever go on facebook and chat with the people that added you?? I always wanted one of those my-size barbies but I was always too tall to fit in the outfit :( but oh well, I did have some pretty cool barbie stuff haha. and I looove your boots! Aww! I wanted a Barbie Dream House, too!! But I DID have this cool folding Barbie kitchen that had an awesome bar stool! I have I think 3 suitcases of Barbies that I haven't looked at in ages. I was pretty lucky cuz my mom gave me all her Barbies from the 70s, but I feel bad saying that the 70s Barbies were so much uglier and they were always ditched in our "Barbie Soap Stories" haha!! I loved my barbies from the 70's. I had the this super cool "Barbie United Friend Ship Airplane where half of the plane was open. You can see them on Ebay going for really cheap right now. You daughter would love that! Hope you do one of the Barbie makeovers. I like the last photo of her the best. 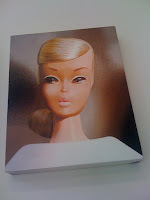 i am sad to say that i am still a Barbie lover. my nick name in high school was......Barbie. lol. i love the vintage look. could you possibly do a tutuorial on something like this? and btw, i love the outfit you had on..........very cute! do you know where you got those boots?